Colorectal cancer (CRC) is one of the most common digestive malignancies in the world. EDNRB is a new candidate tumor suppressor gene which is often down-regulated or even silenced by promoter hypermethylation in various human cancers. However, the function of EDNRB gene in CRC remains unknown. In this study, we examined the expression and DNA methylation of EDNRB in CRC tissues. A total of 42 paired CRC and adjacent normal tissue samples were used to determine mRNA levels and DNA methylation status of EDNRB gene by qRT-PCR and methylation-specific PCR (MSP), respectively. Our study showed that EDNRB promoter hypermethylation was more frequently in CRC tissues than in the normal tissues (92.86 versus 59.52, p = 0.001). Consequently, significantly lower level of EDNRB mRNA was found in CRC tumor samples than in normal samples (0.31 ± 0.91 versus 0.70 ± 1.18, p = 0.032). Our results suggested that EDNRB promoter hypermethylation might downregulate its gene expression in CRC, and thus played an important role in the development of CRC. Colorectal cancer (CRC) is a malignant disease caused by a variety of factors involving with the accumulation of genetic and epigenetic changes. The incidence of CRC is increasing rapidly, and there are 1 million new CRC cases annually . In the developed countries, the mortality of CRC has soared up to 33. CRC has become the second most common cancer in the world , accounting for 9 of all malignant tumors deaths . Although 5-year survival rate of CRC patients has been improved from 22 to 47 in the last 30 years due to the advancement of the early diagnosis, surgical techniques and adjuvant therapies, the overall survival rate remains disappointing. Abberrant expression of some important genes, such as beta-catenin, SATB1 and EGFR, were shown to be significantly associated with the occurrence and prognosis of CRC. Gene promoter hypermethylation often silences gene expression, while promoter hypomethylation tends to activate gene transcription. DNA methylation alteration has been considered as an important event in many malignancies including CRC. Endothelin receptor type B (EDNRB) gene is located on 13q22, encoding a nonselective endothelin B receptor (ETBR) which belongs to a super-family of G-protein coupled receptor that mediates endothelins (ETs) . ETBR is able to promote the production of neural crest cell-specific lineage, and thus it is related to the occurrence of Hirschsprung’s disease  that is a blockage in the colon. There are massive CpG dinucleotide repeats in the 5′-flanking region of EDNRB gene. The methylation of this CpG-riched region was shown to be able to regulate EDNRB gene expression [9–11]. Hypermethylation of EDNRB gene promoter has been observed in leukemia , oral cancer , skin cancer , head and neck cancer , melanoma , renal cell carcinoma , bladder cancer  and prostate cancer . However, the function of EDNRB gene in CRC remains unknown. In light of previous findings in various cancers, we investigate whether EDNRB gene promoter methylation contributes to the risk of CRC in Chinese population. Tumor and its normal adjacent tissue samples were collected at the time of surgery from 42 primary sporadic CRC patients in the Department of Gastrointestinal Surgery in Affiliated Hospital of Ningbo University between June 2012 and April 2013. Normal adjacent tissues were collected at least 5 cm away from the tumor. Tissues were stored in liquid nitrogen at -80°C immediately after excision. The diagnoses of all CRC cases were pathologically confirmed. None of CRC patients had received preoperative chemotherapy or radiation therapy. Tumor stage was determined according to the Duke’s staging system, and cellular differentiation was graded according to the Broders’ grading system. All the patients in the study have signed the informed written consent forms. Genomic DNA from tissue samples were extracted with QIAamp DNA Mini Kit (Qiagen, Hilden, Germany) according to the manufacturer’s instruction. Briefly, tissue sections were incubated with 180 μl of buffer ATL (in QIAamp DNA Mini Kit) and 20 μl of proteinase K on a thermostatic water bath at 56°C for 3 h, followed by incubation at 70°C for 10 min. Then, 200 μl of remixed Buffer AL (in QIAamp DNA Mini Kit) and ethanol (ratio 1:1) were added. Samples were mixed and transferred into QIAamp Mini spin columns. Centrifugation at 8,000 rpm for 1 min was followed by washing the spin column membrane with 500 μl of Buffer AW1 and 500 μl of Buffer AW2. DNA was eluted with 100 μl of Buffer AE. DNA concentration and quality were determined with spectrophotometer. Eluted DNA was bisulphite-treated with ZYMO EZ DNA Methylation-Gold Kit according to the manufacturer’s instruction (Zymo Research, Orange, CA, USA). The bisulphite-modified DNA was resuspended in 10 μl of TE buffer. 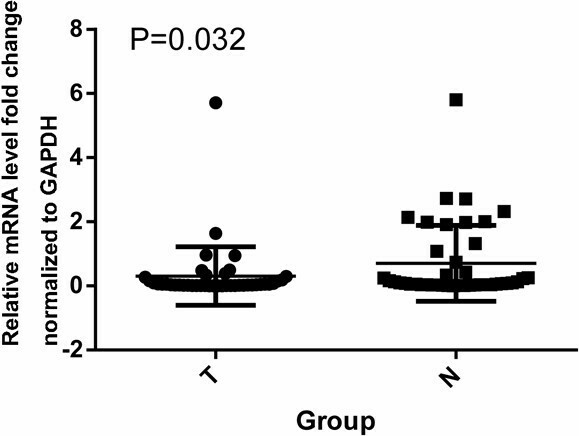 Methylation status of EDNRB promoter was determined by MSP. For the PCR reaction, 2 μl of modified DNA was amplified in a 20 μl reaction containing 0.3 μM each of forward and reverse primers, 0.2 mM dNTPs, 10 × PCR Buffer and 2.5 U of Hot Start DNA Polymerase (Qiagen, Hilden, Germany) under the following conditions: 15 min of denaturation at 95°C followed by 35 cycles of 45 s at 94°C, 45 s at 62°C for methylated primers, 1 min at 72°C and a final extension for 10 min at 72°C. The sequences of methylated and unmethylated primers were given in the previous study  (Table 1). Water blank was used as a negative control. PCR products were subjected to 2.0 agarose gel electrophoresis at 100 V for 20 min, and visualized directly under UV illumination. Samples were considered as methylation or unmethylation, when there were clearly visible bands (130 or 134 bp) on the gel for methylation or unmethylation primers. Total RNA was extracted from fresh frozen CRC and normal tissues from the same patients. RNA was extracted with TRIZOL reagent (Invitrogen Life Technologies Co, USA) according to the manufacturer’s protocol. RNA concentration and quality were determined by NanoDrop ND-1000 (Thermal Fisher Scientific, USA). The first-strand cDNA was synthesized according to the manufacturer’s instruction of M-MLV Reverse Transcriptase (Promega, Wisconsin, USA) with 2 μg DNase I-treated total RNA and 2 μM Oligo (dT)15 primer in a 20 μL volume. Primers for qRT-PCR were listed in Table 1. The qRT-PCR reactions were conducted in a 96-well plate using ABI7500 Real-Time system (Applied Biosystems, CA, USA). Each reaction was performed in triplicate and in a 20 μL volume containing 2× real-time PCR Master Mix with SYBR Green dye (Promega, Wisconsin, USA), 0.4 μM of each primer and 4 μL cDNA, using the following thermal conditions: 95°C for 10 min, followed by 40 cycles of 95°C for 15 s, 60°C for 1 min and 72°C for 40 s. A melting curve analysis from 60°C to 95°C was performed at the end of each PCR to further confirm the specificity of amplicons. GAPDH was used as an endogenous control. The Ct values displayed by the instrument were recorded. Samples were confirmed whether there was a clearly visible band (86/194 bp) on the gel with EDNRB or GAPDH primers (Figure 1). EDNRB and GAPDH mRNA expression in CRC tumor tissue. Statistical analysis was performed by the SPSS statistical package (version 16.0; SPSS, Chicago, IL, USA) and the results were presented using GraphPad prism software. Comparisons of EDNRB promoter methylation were performed by the correction formula of Chi-square test. The 2–ΔCt method was used to analyze the result of qRT-PCR. Two groups of related data were analyzed using paired t-test. The Mann-Whiteney U test was used for two groups of independent data which did not meet normality test. All analyses were two-sided, and p < 0.05 was considered statistically significant. To determine methylation of EDNRB gene, MSP was performed on 42 CRC and 42 adjacent normal tissues in the primary sporadic CRC patients. 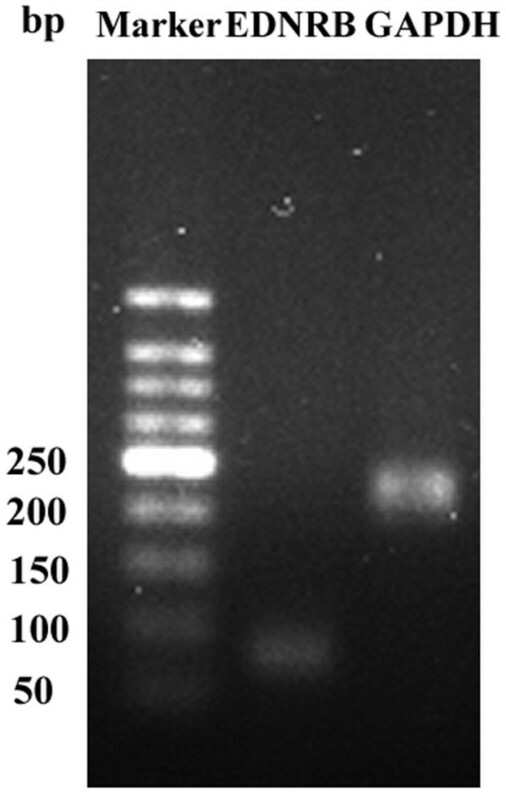 The representative agarose gel electrophoresis results were shown in Figure 2. Methylation status was determined when there were methylated bands in the gel. And unmethylation status was determined if both the methylated and unmethylated bands were not detected, For the unmethylated samples, we repeated the relative experiment two times, including testing the DNA quality, bisulphite modification and MSP (confirming PCR primers quality and PCR conditions). If the methylated and unmethylated bands still did not detect, we confirmed the status of the sample as unmethylation. Our study showed that hypermethylation of EDNRB in CRC tissues was more frequently than in corresponding normal tissues (92.86 versus 59.52, p = 0.001, Table 2). Representative results for methylation status of EDNRB gene in CRC tumor tissues (T) and adjacent normal tissues (N). The relationship between methylation status of EDNRB gene and the clinicopathological characteristics of CRC was shown in Table 3. There was no significant difference in clinicopathological factors such as gender, age, TNM stages, lymph node status, metastasis status, tumor location, differentiation status, tumor size, and histological grade. There was no correlation of EDNRB gene methylation status with the serum levels of carcinoembryonic antigen (CEA) and carbohydrate antigen 19–9 (CA19-9). We determined EDNRB mRNA expression in 42 CRC tissues and 42 adjacent normal colorectal tissues by qRT-PCR. The gene expression level of EDNRB was normalized with the values of the control gene GAPDH. Our results showed that EDNRB mRNA level in CRC tumor samples was significantly lower than in their adjacent normal samples (0.31 ± 0.91 versus 0.70 ± 1.18, p = 0.032, Figure 3, Table 4). Expression level of EDNRB gene in CRC tumor tissues (T) and adjacent normal tissues (N). RT-qPCR was used to analyze the expression level of EDNRB gene in CRC tumor tissues and adjacent normal tissues. The relative expression of EDNRB mRNA level was significantly higher in normal tissues than that in CRC tumor tissues (p = 0.032). *: SD denotes standard deviation and SE denotes standard error. We further examined the relationship between EDNRB mRNA expression and clinicopathological characteristics (Table 5). There was no significant correlation between EDNRB expression and the clinicopathological factors such as gender, age, TNM stages, lymph node status, metastasis status, tumor location, differentiation status, tumor size, and histological classification. Cancer development and progression may be contributed by both genetic and epigenetic factors. As one of the major epigenetic modifications, DNA methylation of promoter often down-regulates gene transcription. A growing number of evidences show that DNA methylation mediated tumor suppressor gene silencing may contribute to tumor progression [22–24]. Aberrant DNA methylated loci have become promising biomarkers in the early diagnosis of diseases [25, 26]. EDNRB is a G protein–coupled receptor that activates a phosphatidylinositol-calcium second messenger system. The product of EDNRB gene (ETB receptor, ETBR) is able to bind to endothelins (ETs), consisting of a family of 3 potent vasoactive peptides (ET1, ET2, and ET3) . During the development of tumor, EDNRB gene transcription is downregulated by promoter hypermethylated, and consequently alters the ET1 signaling pathway . Disruption in the ET1 signaling pathway has been shown to be involved in a variety of human tumor proliferation, angiogenesis, and metastasis [28–30]. EDNRB gene silencing by promoter hypermethylation has been reported in a variety of tumors such as leukemia, oral cancer, skin cancer, head and neck cancer, melanoma, renal cell carcinoma, bladder cancer, and prostate cancer [12–19]. Our study in CRC adds a new piece of evidence for the contribution of EDNRB promoter hypermethylation to the risk of CRC. Our results further confirmed that DNA methylation in the promoter region played a key role in EDNRB transcription. Some reports have focused on the correlation between EDNRB methylation and cancer clinical features [31–33]. Hypermethylation of the EDNRB gene in paired gastric cancer tissues and adjacent normal tissues from 96 patients was detected . EDNRB gene promoter methylation was shown to be associated with gastric cancer tumor invasion . The extent of hypermethylation at CpG island in EDNRB gene was also evaluated in seven prostate cancer cell lines, normal prostate epithelial cells, normal prostate stromal cells, 73 primary prostate cancers, 91 metastatic prostate cancers, and 25 noncancerous prostate tissues . EDNRB CpG island hypermethylation was shown to be correlated with pathological stage and Gleason score to a statistically significant extent in prostate cancer . In the present study, we examined the relationship between the EDNRB methylation and the clinical features. Unfortunately, there was no significant relationship between EDNRB methylation or expression status and the clinical features. And this may be due to a lack of power in our samples. As a kind of glycoprotein produced by colorectal cancer tissue, CEA is a good tumor marker for judging efficacy, disease progression, and prognosis of colorectal cancer. CA19-9 was frequently increased in gastrointestinal tumors such as pancreatic cancer, gastric cancer, and colorectal cancer. CEA and CA19-9 are commonly and traditionally used in clinical colorectal cancer detection. Our study showed no correlation of EDNRB gene methylation status with the serum levels of CEA and CA19-9. This might imply that aberrant EDNRB methylation and conventional tumor markers could serve as complementary markers in the CRC diagnosis, although further work is needed to confirm our hypothesis. In conclusion, we revealed a significant contribution of EDNRB hypermethylation to the risk of CRC. These findings may provide a new clue for detection and treatment of CRC. Future research is needed to determine the detailed mechanism of EDNRB gene in the risk of CRC. Cheng Chen, Lingyan Wang, Qi Liao: co-first authors of this work. The research was supported by the grants from the National Natural Science Foundation of China (31100919 and 81371469), Natural Science Foundation of Zhejiang Province (LR13H020003), K. C. Wong Magna Fund in Ningbo University, Ningbo Social Development Research Projects (2012C50032), and Scientific Innovation Team Project of Ningbo (2011B82014). None of the authors have any commercial or other associations that might pose a conflict of interest. All authors are responsible for the content and writing of the paper. MY and SD participated in research design. YH, HY and FC conducted experiments. LW, QL and LX performed data analysis. The manuscript was drafted by CC and SD, and critically reviewed and discussed with the other co-authors. All the authors read and approved the final manuscript.